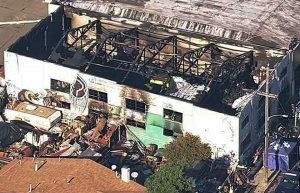 The tragic Ghost Ship warehouse fire in Oakland, California resulted in the deaths of 36 people. The warehouse had been illegally converted into living and working spaces for artists, and the victims of the fire died during a music concert that was being held in the building. The fire demonstrates the problems that can happen when buildings are used for purposes for which they were not intended. Unfortunately, the high real estate prices and rents in cities such as San Francisco, Oakland and Los Angeles has contributed to people using these spaces to work and live even though the buildings are not intended for doing so. Experienced personal injury attorneys may hold the landowners liable by filing lawsuits against them, helping to deter the negligent conduct even when code enforcement may be difficult. The illegal conversion of buildings into spaces for entertainment, work and living quarters has been a growing problem in Southern California and in the Bay Area. This is because the real estate prices and rents are high enough that some people, including artists, have trouble finding affordable places to live. Some building owners have reacted by allowing people to rent and use the spaces as living quarters despite the fact that the buildings are not zoned for residential purposes. The state legislature is now trying to determine how to handle the growing problem through stepped-up enforcement of codes and zoning laws. Unfortunately, the resources are not available to cities and municipalities to adequately investigate all potential zoning and code violations. The civil justice system may provide an alternative means to deter landlords and leaseholders from committing code and zoning violations by holding them liable for negligence under the state’s tort law. Rowland v. Christian is a seminal case in California. The California Supreme Court’s decision in that case eliminated the different categories of visitors to properties in determinations of the duties of care that landlords owe to them. Before the case was decided in 1963, landowners and leaseholders owed different duties of care to people on their properties, depending on whether the people were invitees, licensees or trespassers. In the case, the plaintiff was visiting the defendant. While he was at the defendant’s apartment, he suffered an injury to his hand from a broken water faucet in her bathroom. He filed a lawsuit against the woman because she had failed to warn him about the faucet although she had complained to her landlord about it. The district court dismissed the man’s complaint, and the case was appealed up to the California Supreme Court. By eliminating the distinctions between invitees, licensees and trespassers, the California Supreme Court established a general duty of care that landlords and leaseholders owe to all people who are on their premises. The court held that the proper test for liability for landlords and leaseholders is whether they have acted reasonably in light of the probable danger to others on their property regardless of their statuses. This means that if a property owner illegally converts a building for residential purposes, and it violates fire and safety codes, the property owner may be held to be civilly liable to people who are injured by the dangerous conditions existing on the property. In order to hold a property owner liable, a plaintiff will need to show that the owner owed a duty of care and that the owner violated that duty by failing to correct the hazardous conditions or to warn of their existence. The plaintiff will then have to prove that the property owner’s failure to fix the problems or to warn of the dangers resulted in the accident that injured him or her and that he or she was harmed as a result. In a case in which people are injured or killed because of dangerous conditions existing in illegally converted warehouses and other industrial buildings, the landlord or leaseholder may be liable to pay damages if the plaintiff proves the elements as previously described. By filing personal injury or wrongful death civil lawsuits, the injured victims or the families of people who are killed may be able to recover economic and noneconomic damages to compensate them for all of the losses that the negligent actions caused them to suffer. The damages may include the payment of medical costs, funeral expenses, burial costs, past and future losses of income, disfigurement, loss of consortium and others. The particular damages that may be available will depend on the facts of the plaintiff’s case. People who have been injured by dangerous property conditions in illegally converted buildings might want to consult with an experienced personal injury attorney. A lawyer may analyze the facts and circumstances of the cases in order to provide honest assessments of their winnability. If the lawyer agrees to accept a case, he or she may fight to help recover the amount of monetary damages that will fairly compensate the injured victim or the families of the person who was killed.